We do not provide management capabilities for Mac computers, so there is no monthly service rate for Macs. If you are interested in Mac management support, we’d love to hear from you so we can scope the need and accordingly prioritize building that capability. Mac computers can access Managed Workstation file systems. However, this usage is not covered by our service agreement and any support needed would be billable as part of our consulting service as covered below. Macintosh consulting services include iMac, MacBook, MacBook Air or possibly other assistance. All Mac consulting is subject to a minimum 30 minute charge and can be performed on-site. We provide support for Macs on a per-case basis as a billable consulting service subject to our MWS Consulting Service charges. We can provide assistance in choosing and ordering new computers. We can also provide business analysis to help you find IT solutions to your needs. Please email help@uw.edu if you are interested in learning more about Managed Workstation services. 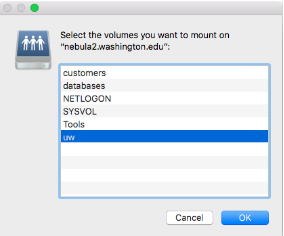 Below you can find additional resources available for Mac users at the University of Washington. Apple Store – University Village. The UW share opens is the I: drive. Inside that share is a folder called “homedir” which contains your H: drive. Note: By default, Macs don’t show connected servers on the Desktop. 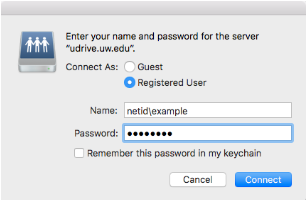 If you need to navigate back to the UW Share, go to the Go menu and select “Computer” or hit Shift-Command-C from the Finder. Office 2011 and OS 10.7 Lion have compatibility issues with each other. It’s strongly recommended that you upgrade your computer from OS 10.7 Lion to the newest OS version supported by your Mac.